CNC press brake can meet the demand of a variety of small-batch products, such as the thin plate, like car front wall, door lintel, car top, car bottom, car frame etc, as well as thick plate products. CNC folder can meet the demand of a variety of small-batch products, such as the thin plate which needs to be lifted (like car wall, car top, car bottom, car frame etc) and the medium thick plate products. Press Brake——The bending angle is controlled by controlling the press amount of the punch. During bending, the short edge is in the inner side, so the operators need to hold up most of the materials outside. For the bending of heavy duty workpiece, two or more workers will be needed for collaboration. CNC Folder——After the sheet metal lay flat on the workbench, the edge beam is pressed down to fix the plate. 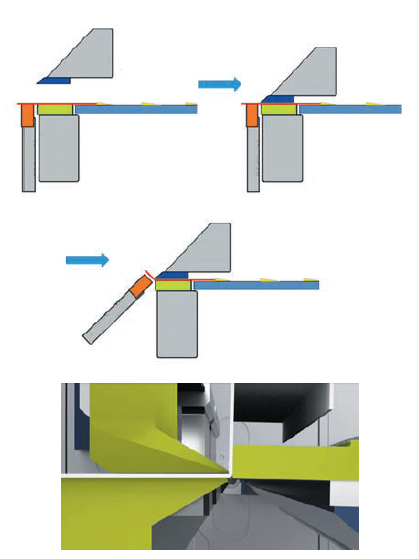 The bending beam turns up and down to achieve edge folding purpose. In all folding operations of one edge, there is no need for manual involvement in positioning and auxiliary flanging and positioning. 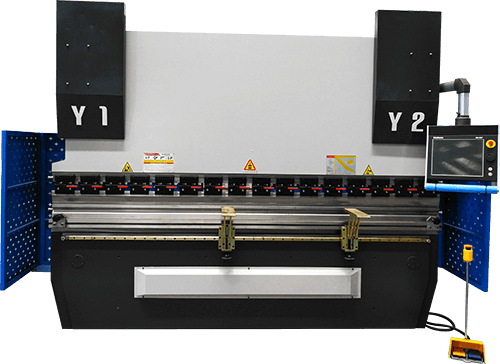 Press Brake——The controlling dimension precision is the short side dimension precision of the backstop material positioning. After the bending is completed, the final error accumulates to the inner space size. 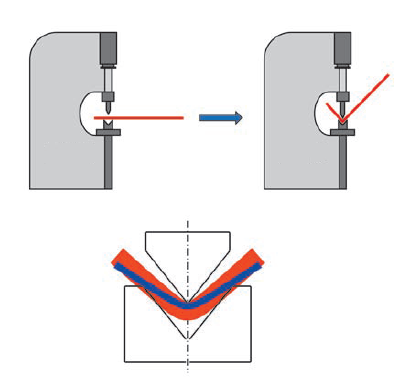 At the same time, because the bending angle is controlled by controlling the press amount of the top punch, the angle is related to the material thickness (FIG. 7). CNC Folder——The controlling dimension precision takes the first edge as the positioning reference after the first fold. The final size of the control is exactly the size of the inner space required by the customer. At the same time, the bending angle is directly controlled folding angel, which has no relation with material thickness (FIG. 8). 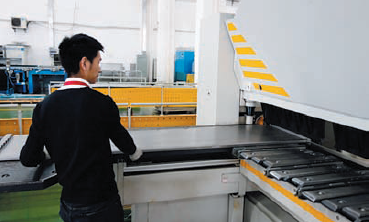 Press Brake——At work, the material will generate relative motion in the lower die. In the absence of surface protection, there will be indentation. When bending a large workpiece, it needs to turn the surface and move many times. Scratches are inevitable in the bending process. CNC Folder——When working, the tool of the edge – pressing beam and the tool of the folding beam do not move relative to the material, so as to completely avoid surface damage. When a large workpiece is bent, it can complete all the processing on one side of the workpiece at the same time because the plate is laid flat, so as to completely avoid surface damage..
Press Brake——It has high requirements for bending worker’s skills. CNC Folder——It can be visually programmed with finger painting or off-line programming by engineers using software, and Import processing program using USB or network connection. After the completion of programming, the main job of the workers becomes simple feeding and unloading work, there is no need for skilled bending workers. 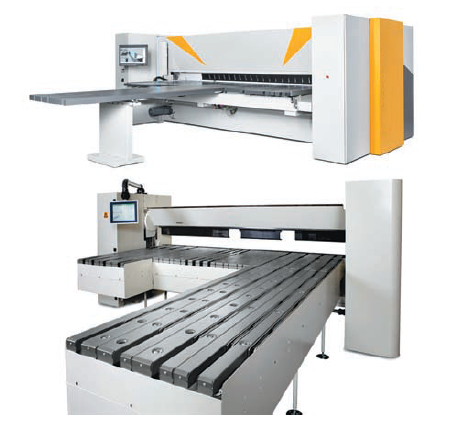 Press Brake——Products of different thickness and shape require different top and bottom dies. In order to meet some special bending (such as arc) requirements, it is necessary to change the tool or transfer to another machine tool, which will increase the transfer and temporary storage of semi-finished products. CNC Folder——Through the allocation of rotatable edge beam, and the installation of two sets of edge beam tools at the same time, all bending procedures can be completed in a single station. For circular arc bending or other special bending requirements, there is no need to change the tool, only to modify the procedure can be fully realized. Press Brake——Since there is a relative motion of the workpiece between the punch and die, the toolings will be worn out, which needs to be maintained or replaced. CNC Folder——The relative motion between material and tool is basically avoided. The tool is used for a long time with little wear and tear, which greatly extend the tool life. Press Brake——The use of hydraulic drive, resulting in more maintenance work and easy to be affected by environmental factors. CNC Folder——Adopt full electric drive design, reduce maintenance workload and have nothing to do with the use environment, so as to achieve higher bending precision. 1) Because of the different bending principle, the bending radius of the folding machine is bigger than that of the press brake. 2) Restricted by the support platform, the workpiece with both sides turn down cannot be processed. 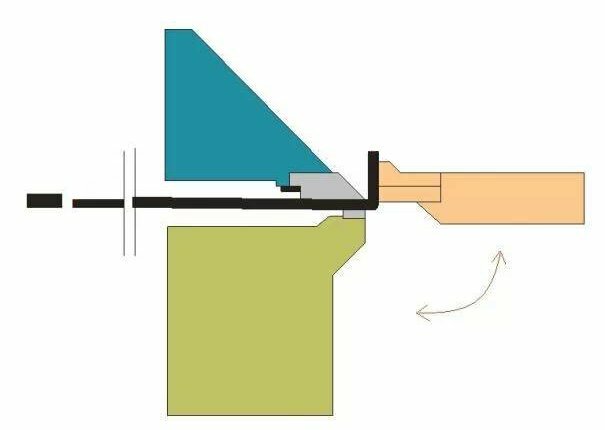 3) The size of the workpiece is limited by the top punch compression area, so the workpiece cannot be processed less than the size of the compression area. 5) Due to the structural characteristics of the press brake and the diversity of toolings, some complex shapes can be easily realized by the press brake. In comparison, the folding machine is less flexible. 6) The edge folding machine is widely used in Europe and the United States at present. 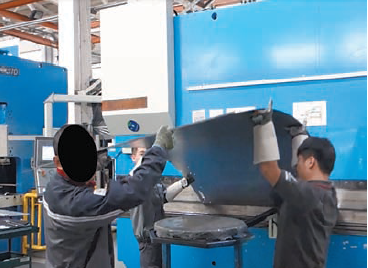 Under the influence of the traditional Japanese processing concept, the countries in the Southeast Asian area generally adopt the press brake instead of the folding machine. In recent years in Europe and the United States, 30% of the sheet metal factory is willing to invest in the use of folding machine instead of press brake for bending fabrication. It is mainly because folding machine operation is more convenient, and it is a kind of bending equipment with many advantages. Certainly, these two kinds of equipment have their own characteristics. 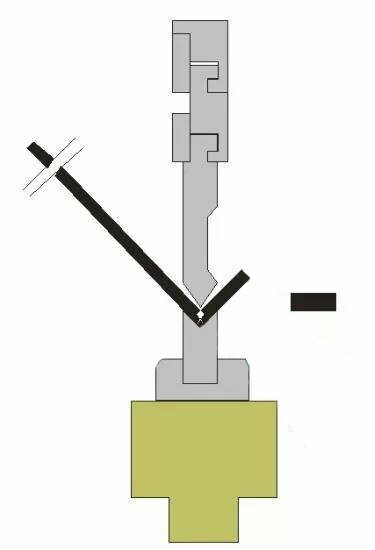 In the entire bending process, the operator must hold the sheet material and rely on manual delivery to the back gauge for positioning. Unsafe for large and heavy-duty sheet operators. Because the weight of the sheet causes the bending angle becomes larger. 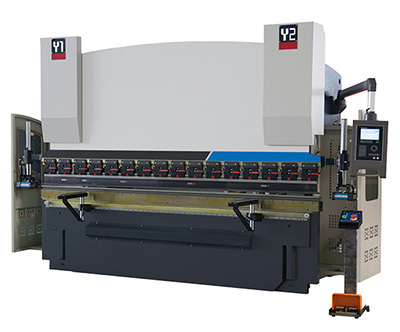 One operator is difficult to complete the bending of large workpieces. The bending angle is determined by the depth of the upper die into the lower die. 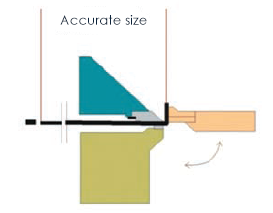 A small deviation of plate thickness causes inconsistent bending angle. 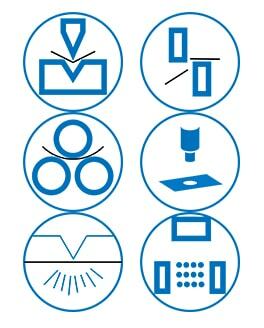 Different plate thickness bends need to be configured with the different punch and dies. The installation and commissioning of the machine require professional knowledge, long boot time. The high cost of buying, replacing and keeping molds. Maximum Bending width is limited by upright. 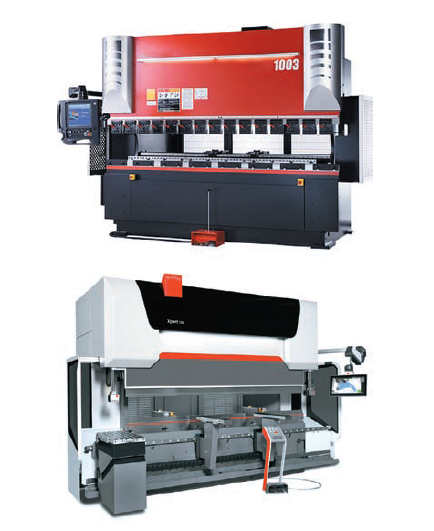 Press brake is more complex to use. The operator must be trained into the professional skilled worker. A longer work cycle for each step. The repetition accuracy of the workpiece depends on the technology of the operator. In the bending process, the sheet material is placed on the worktable of back gauge, to ensure the bending distance and hold the plate. In manual mode, the safety of operators is greatly improved. 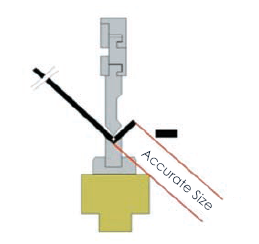 The errors for small thickness will not affect bending accuracy. Bending different thickness of plate does not need to replace the mold. Skill requirements for operators are not high.